July 10, 2017 -- Richard H. Gedda experienced more than his share of family hardship and tragedy in his young life. He was the youngest of seven children born in Bridgeport, in southwest Connecticut, to August Wilhelm Gedda, a hotel janitor, and Alice Hamilton Gedda, who worked as a housekeeper at a rooming house. Richard's parents were both immigrants -- his father arrived in the U.S. from Sweden in 1881, when he was 20 years old, and his mother arrived five years later from Ireland, when she was 15. They married in 1888, and settled in Bridgeport, eventually renting a house on Broad Street as their family grew. Ruby Mathilda was the first child to arrive, in May 1889, followed by Anna Mae in January 1892, William in June 1894, Marion Evangeline in May 1897, Pearl in March 1900, Charles Hamilton in December 1901, and Richard in August 1905. The oldest boy in the family, William, died in 1912, at the age of 18. Three years later, on April 20, 1915, Richard’s mother, Alice, died at the age of 44, when Richard was 10. After Alice's death, August and his three youngest children went to live with his oldest child, Ruby, then 26; her husband Charles Newman, a factory toolmaker; and their two young daughters, Alice and Mildred. To help with household expenses, Pearl, 19, worked in a factory; Charles, 18, was a delivery truck driver; and 14-year-old Richard worked as a factory stock boy. 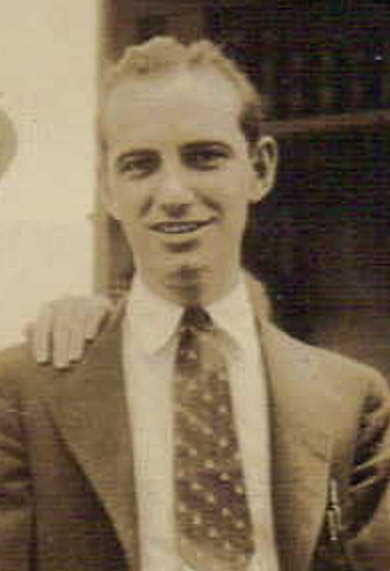 In the 1920s, Richard moved from Connecticut to Colorado, where he found work first as a driver, then as a salesman for Capitol Hill Creamery in Denver. Richard met and married Sarah W. Bath in Denver on March 5, 1928. He was 22, she was 16. The couple had two children -- Alvin Richard Gedda, born on Nov. 23, 1928, and Dorothy Jean Gedda, born on July 2, 1932. The couple divorced in 1936, and both remarried the following year. Sarah got custody of Alvin, while Richard got custody of Dorothy. On Dec. 31, 1937, Richard married Dorothy Elma Randall, who was also recently divorced. Their daughter, Nancy Gayle Gedda, was born Nov. 16, 1938, in Colorado, while Richard was working as a department supervisor for the Works Progress Administration -- part of President Franklin D. Roosevelt's post-Depression jobs program. 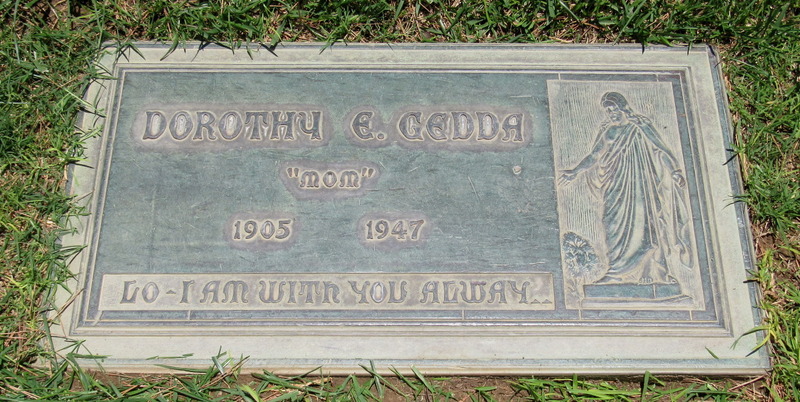 By 1940, Richard and Dorothy Gedda moved to Los Angeles, where he worked as a bookkeeper. Finally, it seemed like Richard Gedda's life was settling down. The couple purchased a house on St. Clair Avenue, near the current location of the Ventura Freeway and Laurel Canyon Boulevard, north of Studio City, where they lived with their two young daughters. A few years later, the family moved to a house on Wilkinson Avenue in North Hollywood. In 1946, the Gedda family decided to take an extended road trip, traveling across the country and back, and stopping to camp along the way. Perhaps they planned to visit Richard's boyhood home in Connecticut, and maybe visit some of his siblings. The Geddas hitched a trailer to the family car, and set off. On Sept. 9, 1946, the family was on the final leg of their 7,000-mile journey. Before heading home, they stopped along the Kaweah River, near the entrance to the Sequoia National Park, about 50 miles southeast of Fresno, in central California. While Richard Gedda changed a tire on the family car, his two daughters, Dorothy, 14, and Nancy, 7, went down to the river to fish. Tulare County Coroner Roy Brooks said he believed that one of the girls fell into the river, and the other jumped in to save her. Both girls drowned. 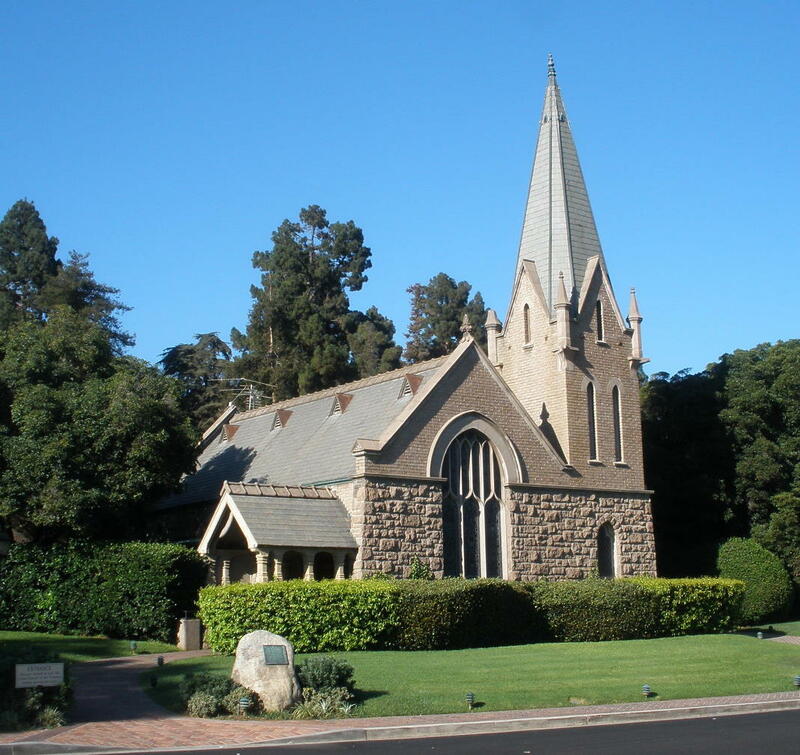 A joint funeral service was held at the Little Church of the Flowers at Forest Lawn Memorial-Park in Glendale, and the girls were buried next to each other. But the family tragedy wasn't over. The girls' mother, Dorothy Gedda, was so distraught by the deaths of her daughters that she was sent to recover in a rest home in Arcadia. 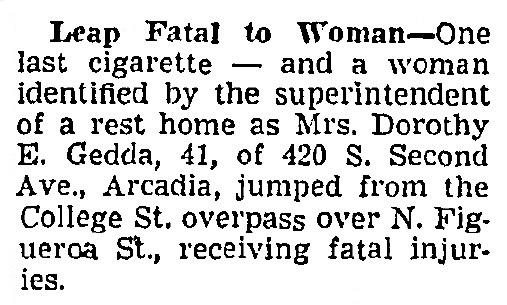 On Feb. 24, 1947, less than six months after the girls' deaths, Dorothy left the rest home, and made her way to the College Street overpass over North Figueroa Avenue in Los Angeles, south of the current location of Dodger Stadium. She smoked a final cigarette on the overpass, then jumped to her death. She was 41 years old, and was buried next to her daughters. 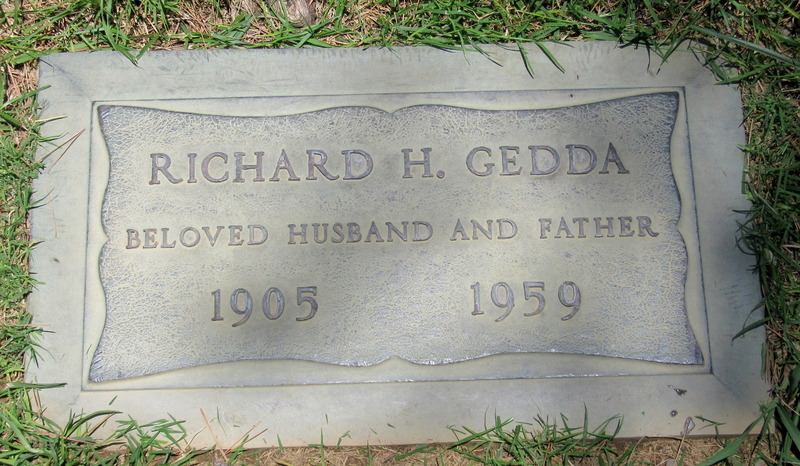 Richard Gedda lived another 12 years, dying on Aug. 14, 1959, the day after his 54th birthday. He joined his wife and daughters at Forest Lawn in Glendale.